Height: ​On the tall side. Personality: Talkative, friendly and sweet natured, always "helping" me with whatever chore I am doing around the pasture. Oh, Harvey... what can I say that will do him justice. This boy holds a special place in my heart. 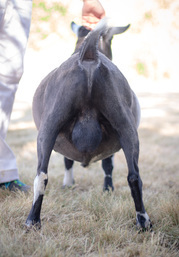 His dam GCH Caprinos RI Night Jasmine 1*M AR - EEEE 91 has a beautifully balanced, productive udder and her offspring continue to prove themselves in both the milk pail, earning their stars, and the show ring. 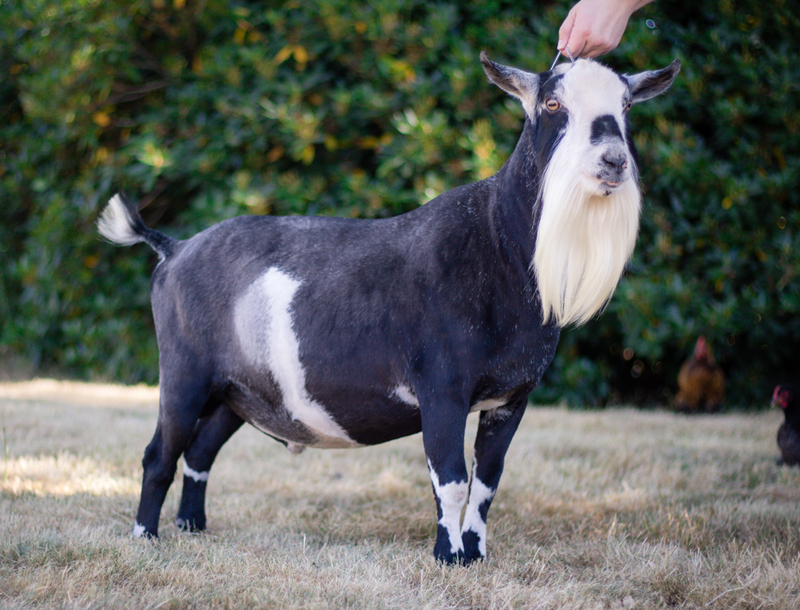 His sire Poppy Patch HB Evel Knievel - VEE 90 brings every bit as much to the table, with a long line of exceptional udders behind him including one of my personal favorite does, CH Honey Goat Domingo. Harvey has excellent conformation and length of body and a very sweet temperament. My favorite kids through the years are always Harvey kids. He is sweet, easy going and wonderfully good natured and passes it on to his offspring. It is a shame he stinks (or perhaps a blessing in disguise) because if he didn't there is a high likelyhood he would have made it into the house by now. You can view the individual kids by visiting our New Arrivals page. 2015: Young stock - VEcEc "V"
2017: Tattoo unreadable when presented. We do not own Harvey's dam Caprinos RI Night Jasmine, but you can view her record on the CDCB website.